As soon as the Saks Fifth Avenue exclusive run its course, the sculptured heel collection was showcased everywhere. 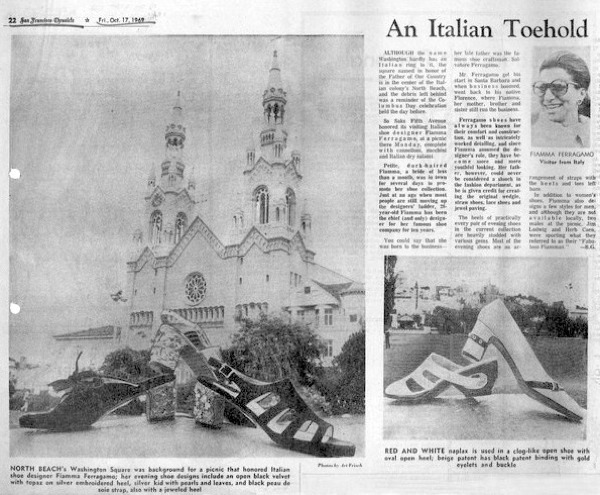 Or at least part of it; it seems, judging by the newspaper clippings, that only two heels survived out of (the fantastic) four designed/sculpted by Ivo Barbaresi, the CASSIDA and the GEO. 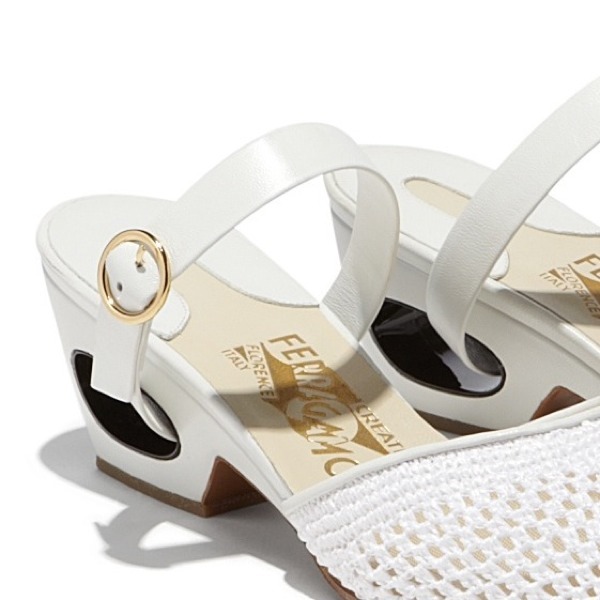 Ferragamo models. 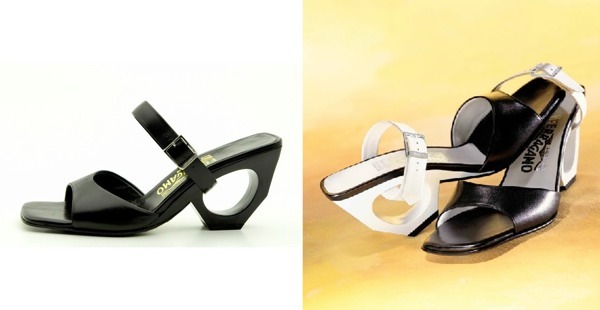 From left: black and white patent leather sandal with hole in heel; model called "Talimera" with heel and arch assembly; mat white satin shoe with encrusted heel. 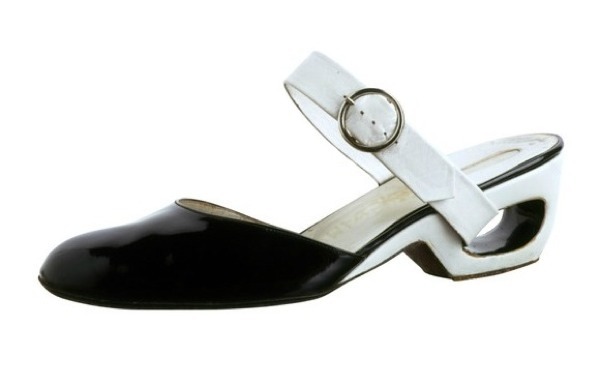 RED AND WHITE naplak is used in a clog-like open shoe with oval open heel; beige patent has black patent binding with gold eyelets and buckle. The CASSIDA heel went into oblivion until the year 2000 when someone got the idea to resurrect it with a new twist. Beauty is in the eye of the beholder, so we can just say it's plain ugly. And short-lived. More recently though, the CASSIDA lived a second life in a limited edition of 500 pairs currently out of stock at Ferragamo. We love it when these kind of things happen (not being out of stock, that is), however the misleading "winner of the 1967 Neiman Marcus award" stuck. Moreover, while they drop it, we root for another CASSIDA edition (even LTD would do it). 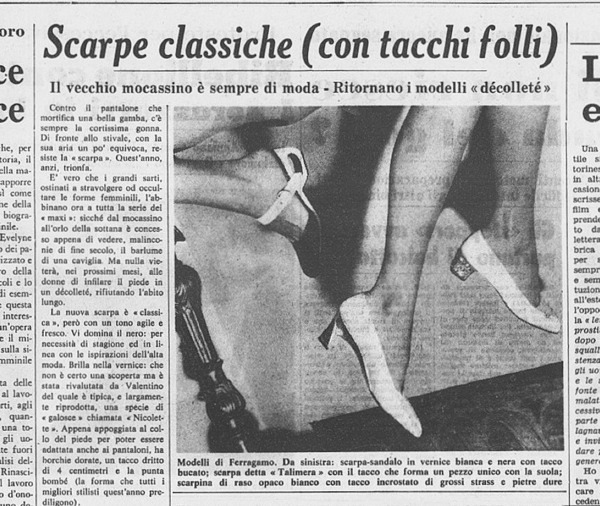 The Fiamma Ferragamo page at ferragamo.com amended the wrong info and correctly placed the model Kalioscia as part of the Neiman Marcus winning collection; however, the online shop description of the Pleja remained untouched.